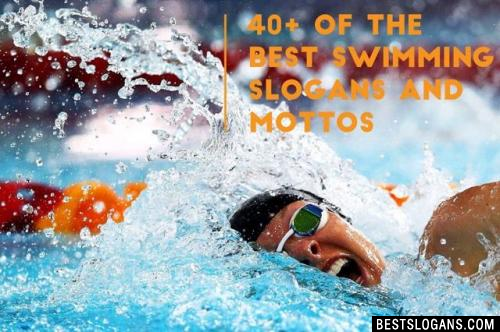 Catchy and motivational swimming slogans to inspire the swim team. Including funny swim phrases & quotes. Swimmers are fascinating. They can make their bodies do weird things. And they have some rather strange rituals. These facts about swimmers will give you a new appreciation for the sport. Freedivers can hold their breath for more than 10 minutes. The average high school swimmer swims 1 million strokes per season. The ability to swim is an important survival skill, but swimming provides a number of health and fitness benefits as well. Swimming is one the few fitness activities that allows participates to engage every muscle in the body. Swimmers also avoid physical damage caused by other types of strenuous exercises. Swimming is an ideal form of exercise for the physically fit and those with physical limitations. When swimming, the water is gentle on sore, fragile and stiff joints that would otherwise be hurt during land-based exercises. Swimming also provides a cardio workout and a strength workout at the same time. Swimming helps tone every part of the body because the entire body is used to swim. All major muscle groups (abs, legs, hips, arms, chest and shoulders) work together when one swims and the water causes resistance against the swimmer. 16 Happiness is Swimming fast! You think your sport is hard? 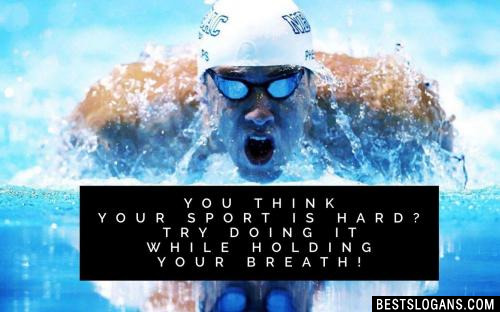 Try doing it while holding your breath! Can you think of a good Swimming Slogans we're missing? Or come up with a clever one of your own. Please share below.